You think I like adventure? You believe that I love traveling to remote lands and photographing native tribes? You assume I love exploring foreign cities, living like a local, and reporting on daily life, food, culture, and more? Naw. I love talking about nails, makeup, hair, purses, and shoes. That’s what matters in life, I say. Which is precisely why I was pumped when I heard I’d be photographing the Red Bull UCI Mountain Bike World Cup over the weekend. Held at Windham Mountain in the Catskill Mountains of New York, this exciting event—held in the USA for the first time in years—was little more than an hour’s drive away. Though I love biking and was given free reign to shoot as a press photographer, the most exciting event was Saturday’s Downhill event. The best bikers competed in the junior’s, women’s, and men’s divisions, and it proved to be quite an exciting day. Minus the beginning, that is. Less than 10 minutes into being there, I was photographing the cross-country race. While this might not sound exciting, it’s actually full of folks from around the world who go careening down hills, biking on roads, pedaling hard uphill, speeding through steep curves, and “small” jumping over rocks and little hurdles. It’s only for those well-versed in mountain biking. While photographing a section where bikers emerge from a rocky forest section, two bikers were battling it out, and one hit a rock (or perhaps the other biker?). His eyes widened, his bike careened, and he went flying over the course markers and onto the hard rocks just a foot in front of me. I yelled for a medic and kept asking if he was okay (despite blood coming out from his mouth, ear, and various visible body parts), but he was squealing and grunting. The sounds were not pleasant, but his friends rushed over and helped him on his way. Hopefully he’s all right! Luckily that was the worst scare of the day, though upon seeing the professional’s downhill course, my heart skipped a beat for non-romantic reasons. One section careened blindly off a rock and over a brook, with only a narrow wooden bridge (and no corner bumpers or protectors) to land on. One wrong move at 45 m.p.h. and you are, pardon my English, dead meat. You can get a sense of the action from the Red Bull recap below, or you can watch an even better video on their site. Naturally, there’s no way to tell just how fast these bikers are going–or how impossibly steep this mountain really is. The juniors were fun to watch, but the women were quite impressive. Along with other special-access visual media press, I would lie on my stomach around a steep bend in order to get just the right shots. Drunkards around us—otherwise known as spectators—were luckily not on the course too much, and photographers/videographers were given special sections on either sides of the course. Up the mountain, the view of the green Catskills were just lovely, making for quite the nice jump backdrop. One of my favorite perspectives was taken from the chairlift and getting the timing right as a biker came down. But the best moment of all, besides seeing American Aaron Gwin zoom into first place with just one racer to go, was seeing the last racer come down the hill as the whole crowd held their breath. Brit Josh Bryceland—otherwise known as Rat Boy—came charging down the hill as the audience started shouting at the splits. I darted near the finish line and snapped a few photos just as he came into view on the bumpy home stretch. The crowd went wild as he zoomed under the finish line and first place by a whopping 1.5 seconds. The media stormed him, and Red Bull captured it all on film. 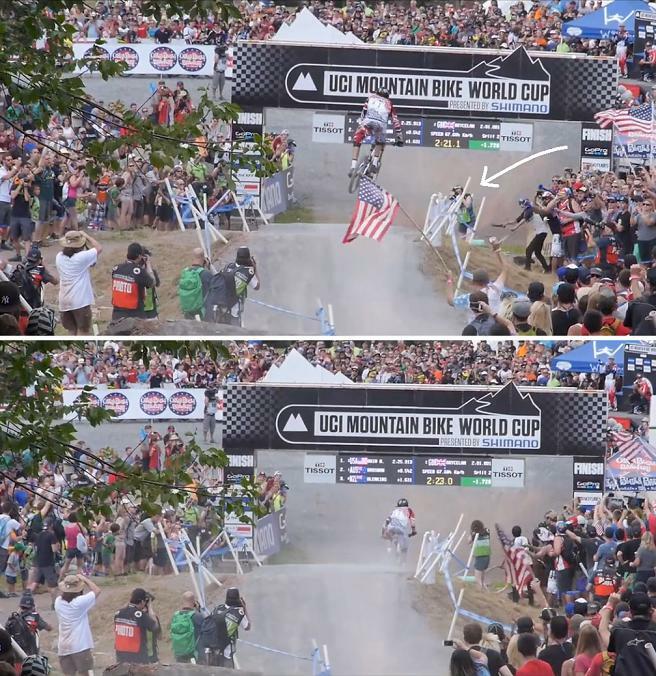 Just to be obnoxious, you can see the digital stills from Red Bull’s footage. I’m standing near the finish line in my issued green photo vest. If I have any advice to give, it’s this: Wear a helmet, kids. I saw several people who weren’t, and there’s simply no excuse–though it’s your life, I suppose. And second, don’t go into mountain biking as a professional. Everyone–competitors and spectators alike–were in casts, bandages, and slings, and all were talking about their latest wipe-outs. Oy vey. ‘Twas quite the exciting day, and I barely got sunburned! Believe it or not, it was a long-time dream to photograph a downhill mountain biking affair, and I cannot wait to up the ante for the next Red Bull event. Or X-Games. Or the Olympics. I’m open to whatever adventure comes next! That black eye on winner Rat Boy ain’t from biking. It happened in a bar. 2nd place Aaron Gwin. I’m reflected in his sunglasses. This entry was tagged Aaron Gwin photos, adventure photography, Anti Tourist, Anti Tourist Traveler, Anti-tourist travel, Josh Brycland photos, Kathryn Cooper, Kathryn Cooper photography, mountain bike photography, Red Bull Mountain Biking, UCI Mountain Bike World Cup 2014, Windham mountain biking, windham world cup. Bookmark the permalink.